The importance of your Accounts Receivable to your company's bottom line as well as the tools to help you collect past due amounts were given high priority in the design of entrée. After all, what good is it to have outstanding sales volume, but then have issues with customers paying for their purchases? For example, you can generate easy to read statements for your customers which can be emailed, faxed or printed. 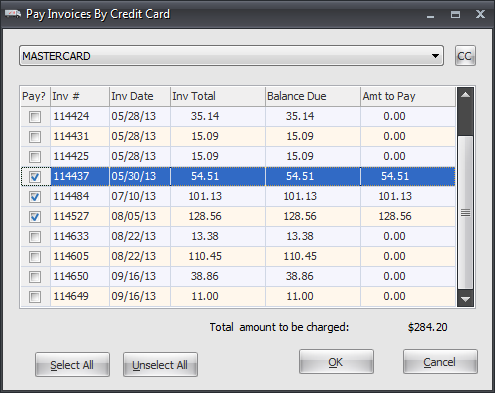 The easy to use Cash Receipts with the "smart" option will speed you along the application of payments, credits, etc. 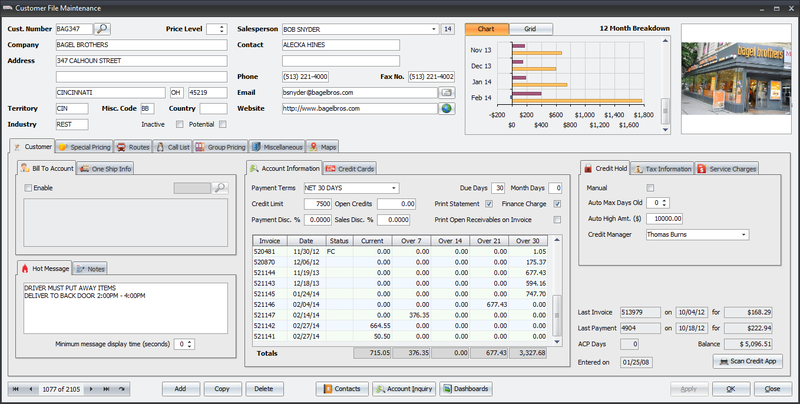 The automatic Credit Hold feature will help your credit manager review and authorize customer orders. All the tools to help your office and sales staff succeed with the Accounts Receivable process are included. Customer Account Inquiry allows entrée users to quickly see a summary of a customer's account status. 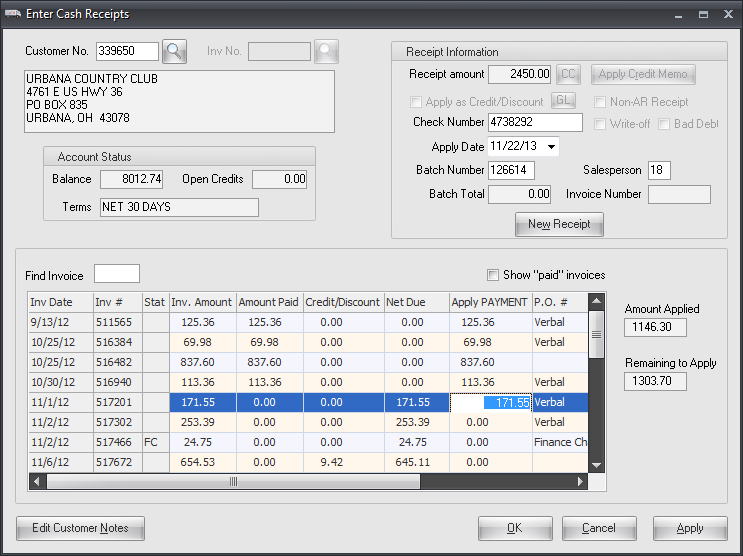 You will have access to this screen in key areas of entrée, such as when creating or changing invoices. 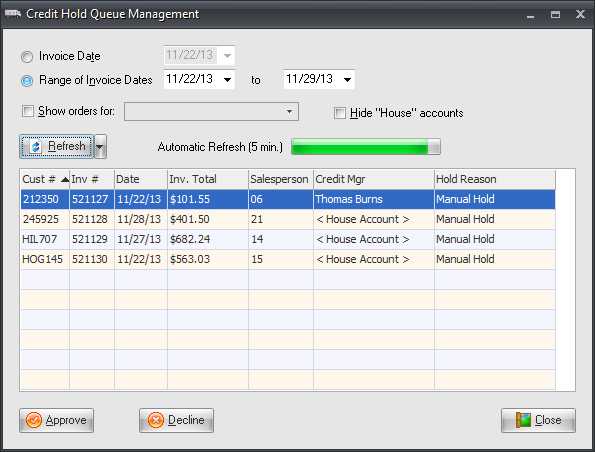 All of the open invoices of a customer as well as the paid invoices of the current period are displayed. Double clicking on a displayed invoice will allow you to view all the line item details and other information about that invoice. You can also view other important information here such as the customer's MTD/YTD sales and a detailed breakdown of cash receipts. The ability to print, fax or email an Aging Report or any invoice which appears on this screen is another import feature. The easy to use cash receipt process in entrée will speed your office staff in entering payments from your customers while ensuring that the information entered is accurate. The cash receipts entry process works with any combination of checks, cash, credit memos and open credits. You can also apply non-accounts receivable type transactions as well as indicating "Write-Off's" and "Bad Debt". All activity is assigned to a six digit Batch Number for reporting and accountability. 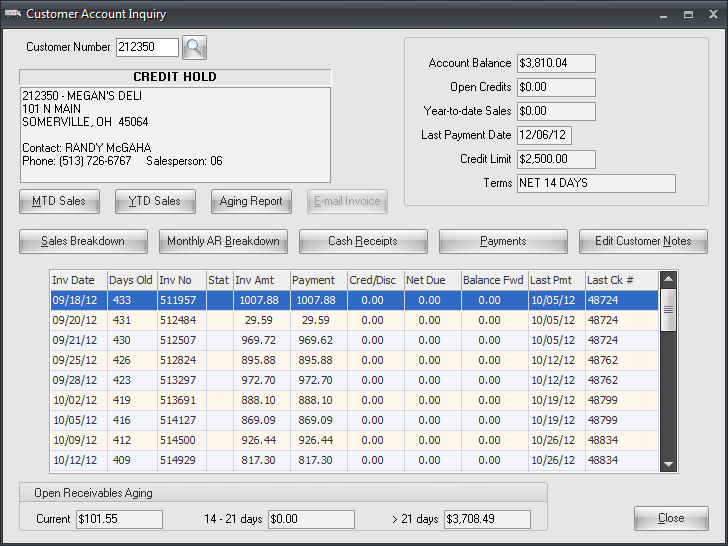 Statements are the most commonly used collection tool in entrée, with variations including Letters of Dunning and Aging Reports. Statements are typically printed periodically and then mailed or emailed directly to the customer. Statements may be printed on pre printed forms or on plain paper. They can generate special comments you define depending on the aging of the customers oldest past due invoice. 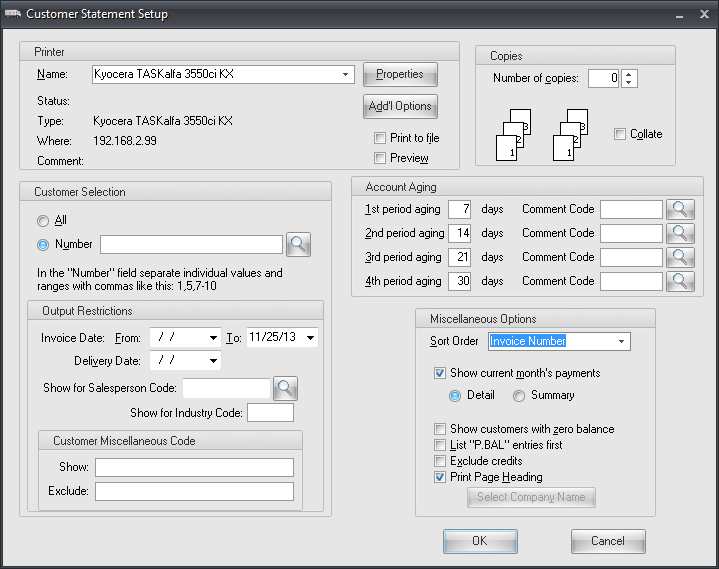 You can also print statement information optionally on customer invoices, so the customer can always be aware of their past due invoices. The entrée system can automatically monitor a customer's accounts receivable and place them on credit hold if they fall behind in payments or reach a specified maximum balance. Invoices, credit memos, sales orders and quotations cannot be generated or edited for customers that are on credit hold unless a supervisor password is provided. Customers can be automatically removed from credit hold when the customer makes a payment bringing their past due invoices within the specified parameters or the customer makes a payment bringing them under the maximum balance allowed. When a customer is placed on Credit Hold, entrée will refuse to accept any new orders for that customer. However, enabling the "Credit Hold Option" option allows you to take an entirely different approach to the situation. Rather than outright rejecting a new order from a customer with a credit issue, this feature allows the order to be entered but flagged as being "On Hold'. These orders must then explicitly be accepted or declined by a user designated as a Credit Manager using the "Credit Hold Queue Management" feature of entrée. The credit card processing features of entrée allow you to accept credit cards and automatically have the funds transferred into your bank account. There are no credit card terminals to purchase and you can accept MasterCard, Visa, American Express and Discover within your entrée system at very reasonable processing rates. It uses the latest technology via the internet, so that transactions are instantaneous and the funds are put into your bank account within 24 hours. The dashboards built into entrée provide you with important business intelligence, with Accounts Receivable being an important feature. One such dashboard is the Customer Payment Summary which allows you to analyze customer payment information with a completely flexible and intuitive interface. 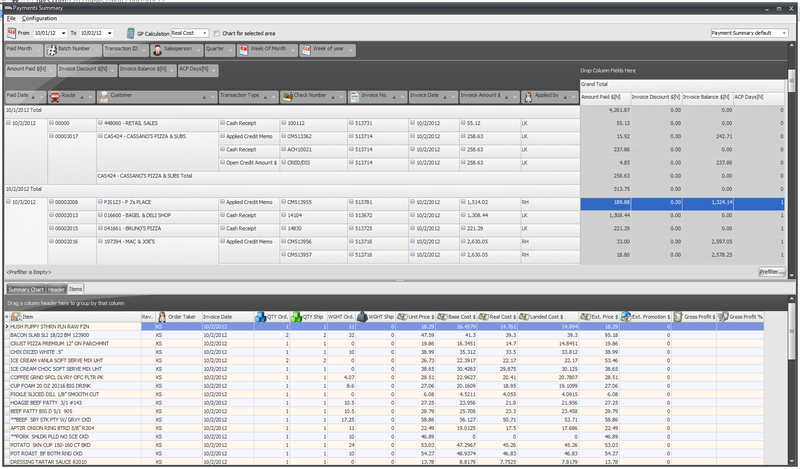 Drill down features are provided right down to the line items on a selected invoice. This is an important tool which your Accounts Receivable staff will find extremely useful and utilize consistently throughout their day.